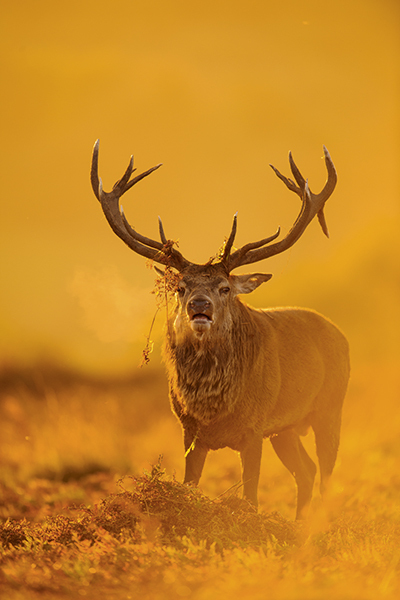 With the annual deer rut taking place, it’s the best time of the year to capture these evocative beasts, as Andrew Mason reveals. The greatest numbers of deer are found on the open moorlands and hills of the Scottish Highlands and Islands. Red deer are the largest of Britain’s six deer species and, along with roe deer, are the only truly native species of deer in the British Isles. Red deer are widespread across the Scottish Highlands and Islands, south-west Scotland, south-west England and south-west Ireland. Smaller scattered populations can be found in the north of England, north Midlands, East Anglia and in Wales. They are also found in deer parks throughout the UK. Adults vary from 110-140cm tall at the shoulder and weigh 65-190kg. Males are larger than females. Grasses, heather, bilberries, dwarf shrubs, tree shoots and bark, as well as seaweed in coastal areas. Breeding season occurs each year from late September to November. Red deer are active throughout the day and night, with peak activity around dawn and dusk. Adult males and females form separate groups for most of the year, but come together during the annual rut. Only adult males have antlers, which grow each year at the start of spring and are shed at the end of winter. The greatest numbers of red deer are found on the open moorlands and hills of the Scottish Highlands and Islands. They can also be found in treeless areas in the north and south-west of England, as well as parts of Ireland. Elsewhere in the British Isles they can be found in woodland and farmland fringes, heathland, conifer plantations and deer parks. Red deer have a very actue sense of sight, hearing and smell. The two best times for photographing red deer are during the rut in late September to November and during the winter months, particularly when there is snow on the ground. 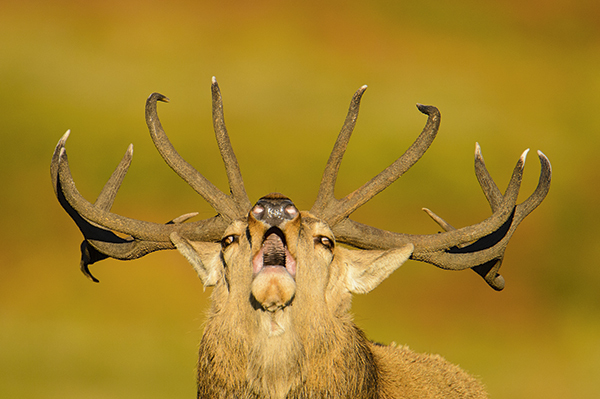 The annual rut is one of the highlights of the wildlife calendar in Britain. During the rut, the stags and hinds come together, with the stags seeking to defend their harems of hinds against competing males for the right to breed. The deers’ behaviour during the rut presents many photographic opportunities. A 70-200mm lens is handy for wider environmental shots of red deer. Truly wild red deer are, in most circumstances, incredibly wary of humans. Photographing them requires a very high level of fieldcraft. However, for many centuries they have been kept in deer parks throughout the UK. While still wild, the deer in parks have become accustomed to humans, making it far easier to photograph them. 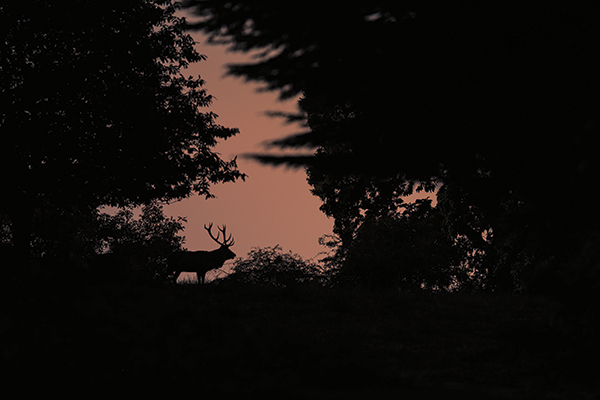 During the rut, deer tend to favour certain locations and, once you’ve identified, these, the best time of day and position to photograph from can be established. While photographing a bellowing stag in early-morning mist backlit in golden light is high on most photographers’ lists, there are many other images that can be made during the rut. Look for fights between rival stags and experiment with different shutter speeds for these clashes. Stags make excellent silhouettes. The annual rut is one of the highlights of the wildlife calander. During the winter months, particularly during periods of prolonged snow (as food becomes more difficult to find), red deer may become less wary of humans in their search for food. They will also come down to lower levels to feed, and may come close to roads in certain moorland areas. All red deer, even those in deer parks, are wild animals and should always be treated with the utmost respect and caution. During the rut, stags are pumped full of testosterone and can be particularly dangerous. Hinds give birth to their calves at the beginning of summer and are highly protective of their offspring. 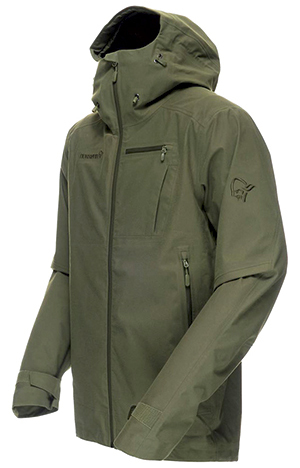 If attempting to stalk and photograph truly wild deer outside deer parks, you’ll require clothing made out of ‘silent fabrics’ that are muted in colour. Otherwise, comfortable clothes that are not too bright are ideal. A long telephoto lens around 500mm will allow a safe working distance when photographing red deer. 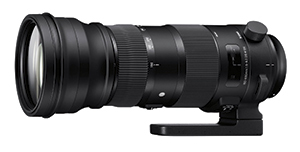 A 70-200mm zoom is also useful to have with you for environmental images.